In the increasingly popular world of a cappella singing groups, Accent has carved out its own niche. Inspired by the wizardly jazz harmonies of TAKE 6 and, before them, The Hi-Lo’s, the six men of Accent, all of them accomplished arrangers and instrumentalists in their own right, decided to take their love of close-harmony jazz singing – the denser and more intricate the better – as far as it could go. Accent is six singer/arrangers, all of whom have considerable musical careers in their home countries: Jean-Baptiste (“JB”) Craipeau (France) – tenor 1; Simon Åkesson (Sweden) – tenor 2; Danny Fong (Canada) – tenor 3; Andrew Kesler (Canada) – tenor 4; James Rose (United Kingdom) – baritone; and Evan Sanders (USA) – bass. Having originally met and recorded together via the Internet, they have since come together to record and tour, becoming an international vocal supergroup. Their amazing blend and arrangements have been acclaimed by a cappella devotees and fellow musicians alike. Cedric Dent of TAKE 6, Clark Burroughs of The Hi-Lo’s and Alan Paul of The Manhattan Transfer have all sung their praises. 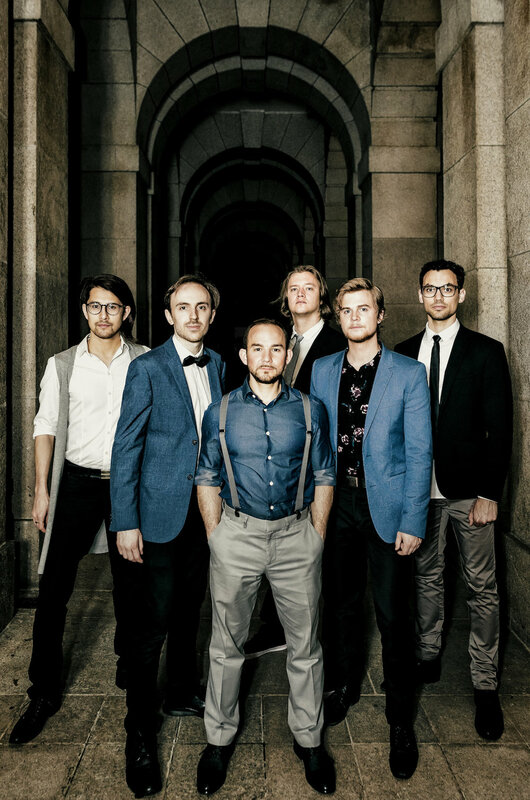 Accent is, arguably, the most spectacular jazz vocal group since TAKE 6, singing original arrangements that are daring and dazzling but never lose the melody, even as they effortlessly execute seemingly impossible chordal shifts. The improbable meeting of Evan, James, Andrew, Danny, Simon and JB could have happened only in the age of social media. The self-described “jazz vocal nerds” became long-distance fans of each other’s elaborate multi-tracked jazz vocal videos on YouTube. In 2011 they decided to join forces, collaborating online on new vocal arrangements and videos. Since then, they have released two albums (fan-funded at https://www.patreon.com/Accent), performed at the London A Cappella Festival, played dates in Germany, France, Sweden, Mexico and the U.S., and were featured in a sold-out Christmas show at the Royal Albert Hall with British big-band leader Guy Barker and jazz singers Kurt Elling and Clare Teal.